Paratrooper Bob Nobles fought for a week in Normandy with the 82n Airborne Division until captured by the Germans. Then his new war began. “The lieutenant said for everyone to lay your arms down,” a fellow paratrooper told Pfc. Bob Nobles, who had been fighting for six grueling days in the hedgerows following his unit’s jump into Normandy. Nobles and his comrades of Company C, 508th Parachute Infantry Regiment, 82nd Airborne Division, were surrounded by Germans. After a short firefight, their lieutenant put out the word and Nobles, an elite warrior with one of the most storied units of World War II, was now a prisoner of war. Back in early December 1941, 21-year-old Nobles was eating dinner at his sister’s house in Ithaca, New York, when he learned the Japanese had bombed Pearl Harbor. “I knew it was coming,” he explained. He had already registered for the draft and lost his job at an adding machine company that was converting to make war materials. He grew up in a family of six, with three older siblings and two younger. He had a newspaper route to help his family’s finances, but it was not enough. “Every time the rent came due, we moved,” he recalled. 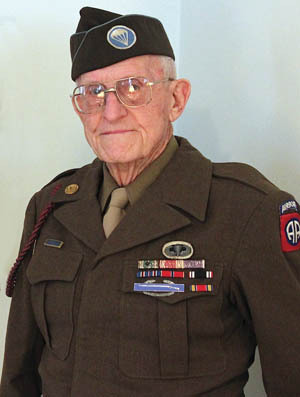 Paratrooper Bob Nobles jumped into Normandy, France, on D-Day and fought for six days before the Germans captured him. Portrait of Bob in 1943. When Nobles’ draft notice arrived, he and his best friend headed to Fort Niagara, New York, for induction, leaving behind Nobles’ girlfriend, Bette Ridley, whom he had been dating for the past five years. He signed up for the paratroopers, having seen the 1941 movie Parachute Battalion starring Robert Preston and thinking, “That looks like fun.” His friend, however, thought the paratroopers were too dangerous. Nobles’ friend opted for the Air Corps and later died in a plane crash at Fort Bragg. 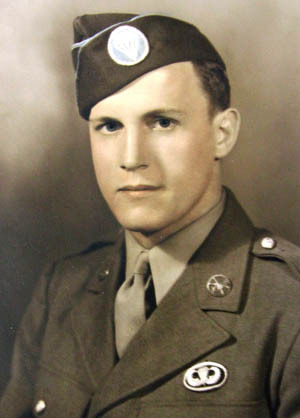 Nobles did his basic training at Camp Blanding, about 50 miles southwest of Jacksonville, Florida, where he was assigned to Company C of the newly formed 508th Parachute Infantry Regiment, under the command of Lt. Col. Roy E. Lindquist; out of 4,500 men who originally joined the unit only 2,300 would pass the airborne requirements. The maximum age limit for airborne recruits at that time was 32, resulting in a lot of the older soldiers washing out. Nobles enjoyed the camaraderie and work schedule of the camp, remembering it as “kinda like college.” The 508th, also later known as the Red Devils, became part of Maj. Gen. Mattew B. Ridgway’s 82nd Airborne Division. The training introduced Nobles to the M-1 Garand rifle, of which he took particular care; he developed the habit of cleaning it whenever possible. Whenever he waded through a stream, he would strip it down and clean and oil the parts. “Inspectors didn’t have to check it,” Nobles said proudly. After basic training at Blanding, it was off to Fort Benning, Georgia, to learn to be a paratrooper. 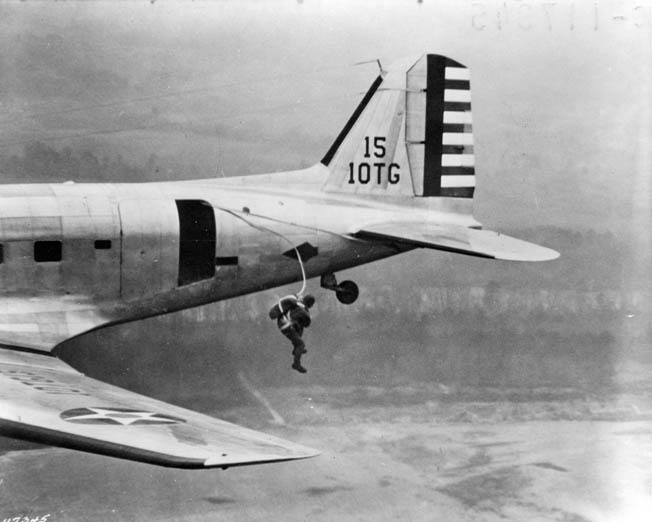 To qualify for silver wings on his chest, Nobles had to make five jumps from a Douglas C-47 Skytrain. The fourth jump was a real challenge. As Nobles’ plane approached the drop zone, one paratrooper in the middle of the line (also called a stick) froze and refused to jump. The plane circled over the drop zone a second time and a third time, but still the man refused. As the rest of the men in the plane became nervous from the pent-up anxiety and the false jumps, some began vomiting. As the smell permeated the cabin, others succumbed. By the time the plane reached the drop zone for a fourth pass, everyone was throwing up. “That stuff was running down on the floor,” remembered Nobles, “and that was not a good feeling.” The man finally jumped, followed immediately by the whole stick. “We were anxious to get out of the plane.” Luckily, the fifth jump went off without a hitch. Now fully parachute qualified, Nobles and the rest of his regiment were sent to Camp Mackall in North Carolina for 13 weeks of intense unit training. Anyone who fell out of a daily exercise had to remain in the camp and salute those who made it. When an especially cruel sergeant fell out on the last day of a 33-day exercise, the men cheered. “It lifted everyone’s spirits,” said Nobles. It was at Camp Mackall that Bette finally got to see her longtime boyfriend again. She visited with Nobles’ friend Charlie Howe’s girlfriend. With three-day passes, the two couples headed off to Charlotte and checked into separate rooms at a local hotel. They were enjoying each other’s company when military policemen knocked on the door. “They were protecting us from hookers,” recalled Nobles. After the weekend, the two girlfriends stayed in nearby Hamilton and came to the post to watch the parachutists in their airdrops. On one jump, Nobles told Bette which plane he would be in and even dropped a roll of toilet paper out the door before he jumped so that the women would know where he and Howe were landing. But the two women, as paratroopers dropped around their car, forgot to count the planes and missed Nobles’ paper streamer. Nevertheless, Nobles and Howe visited their girlfriends at night, and since Howe had a car they could be back on base in time for reveille. On Easter Sunday, April 25, 1943, Nobles and Howe married their girlfriends in a double wedding ceremony. After a quick honeymoon, they returned to their regiment, which soon shipped out to Cheraw, South Carolina, for large-scale war games, followed in August with more war games in Tennessee. On December 19, the well-trained and newly married Nobles headed next to Camp Shanks, near Orangeburg, New York, with the rest of the 508th’s 1st Battalion. Once billeted, the men were given final examinations and inoculated for typhus and other diseases. Three days later, they boarded the U.S. Army transport James Parker and headed to sea. 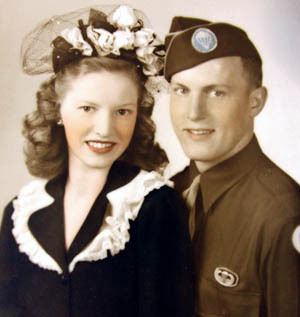 Nobles married Bette Ridley on April 25, 1943, while he trained at Fort Mackall, North Carolina. Would they be headed to the Mediterranean, where elements of the 82nd Airborne were fighting in Italy, or head south through the Panama Canal, destined for the islands of the Pacific? Would they dock in England and await the invasion of France? If their battalion commander, Lt. Col. Herbert Batcheller, or company commander, Captain Walter Silvers, knew, they weren’t talking. Until they were at sea, the Army did not divulge their destination for security reasons. While sailing east across the Atlantic, the men learned their destination was Northern Ireland and that they eventually would be part of the invasion of France. “We arrived in the snow,” recalled Nobles. Wollaton Park is a large country estate that was created in the 16th century. Wollaton Hall, the main manor house, which today is a museum, bears a vague resemblance to the sumptuous home in the PBS series Downton Abbey. The grounds surrounding the manor house were converted into an Army camp. While Nobles and his comrades trained for the airborne drop into France, the two American airborne divisions in England, the veteran 82nd and green 101st, were going through changes. Originally, both were composed of two parachute infantry regiments and a glider regiment, but a third parachute regiment was added to each for Normandy. 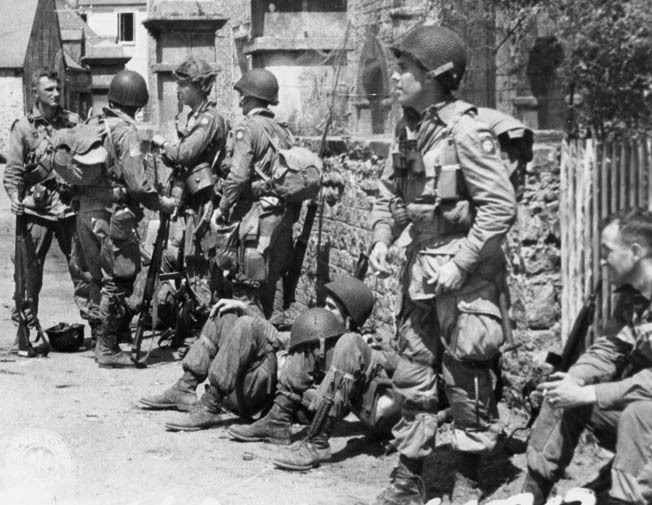 Ridgway’s 82nd had proven itself in heavy fighting in Sicily and Italy with the 505th and 504th Parachute Infantry Regiments. But, while the 505th reached Ireland in December, the 504th remained in Italy and did not return to England until April, a scant two months before June 6, 1944—D-Day. With its numbers reduced by combat and the men exhausted, the 504th would sit out D-Day, replaced by Colonel George V. Millett Jr.’s 507th and Colonel Lindquist’s 508th. The Allies planned to drop the 82nd and 101st Airborne Divisions behind Utah Beach, on the western flank of the Normandy invasion. Both divisions would hold bridges, causeways, river locks, towns, and road intersections to support the American 4th Infantry Division’s amphibious assault. Lindquist’s 508th would be dropped west of the Merderet River on the 82nd’s far west sector. Its mission: protect bridges over the Douve and Merderet Rivers and the road intersections near the towns of Brienville and Beuzeville-la-Bastille, blocking the Germans from pushing the 4th Infantry back into the English Channel. Nobles’ company would be protecting a road intersection. Nobles shown fully equipped for a parachute jump during training with the 508th Parachute Infantry Regiment at Camp Mackall, North Carolina. Bette came to see some of his jumps. Now it was a matter of waiting. Physical conditioning was stepped up, and the practice jumps ended. No one was told when the operation would start or where it would take place. Most of the soldiers correctly guessed it would be in northern France, but that’s all they knew. At the end of May, the parachute divisions were trucked from their encampments and locked into tightly guarded airfields where row after row of C-47s and gliders were parked. The 508th’s 1st and 3rd Battalions were taken to RAF Station Folkingham, 31 miles southeast of Nottingham. There, paratroopers studied detailed maps, aerial photos, and sand tables showing villages, coastlines, rivers, and roads, but there were no identifying names on any of the information. A couple of days before Operation Overlord was scheduled to begin, a powerful storm was predicted to blow across Britain and the English Channel. The weather prediction was frightening enough to cause General Dwight D. Eisenhower and SHAEF to postpone the start of the invasion for 24 hours; it was reset for the early morning hours of June 6, and the paratroopers would lead the way. D-Day arrived. In the late-night darkness of June 5, after receiving doughnuts and coffee from Red Cross Doughnut Dollies at RAF Station Folkingham, Nobles and the rest of the men in the 508th’s 1st and 3rd Battalions strapped on their gear and weapons; Nobles also packed four letters from Bette. The men in Nobles’ stick then loaded onto a C-47 that belonged to the Ninth Air Force’s 313th Troop Carrier Group and roared off the tarmac shortly before midnight, heading for Normandy along with hundreds of other planes. A paratrooper at Fort Benning, Georgia, makes a practice jump from a C-47 Skytrain. Nobles once dropped a roll of toilet paper before he jumped so Bette could identify him. Late on the afternoon of D-Day, as the sun began to set, C-47s flew over Nobles’ head, releasing gliders. “We didn’t see them land,” he said. They landed too far away, behind numerous hedgerows. But that was it for Allied air cover. “Before we left England, someone told me, ‘There are gonna be planes above you, on your sides, everywhere.’” Where were all the planes? Nobles never saw any Allied air cover the entire time he fought in Normandy. For six days, Nobles and his group roamed the hedgerows looking for the road intersection they were supposed to hold. At one point he tried to climb a steep, nine-foot-high hedgerow while a paratrooper holding a bayoneted rifle stood behind him, ready to follow. But Nobles slid back and nicked his buttocks on the bayonet. To hide from the Germans, the paratroopers moved at night and slept during the day. They asked local French farmers where their intersection might be, but the language barrier made communicating difficult. “One guy spoke Latin and conversed with the French,” Nobles recalled, but it did not help. The men never found their intersection, and they never came across any other Americans—only some French farmers burying dead paratroopers. The Americans did manage to capture a few Germans. At first Nobles and his lost comrades survived on K-rations, which no one liked, except for the chocolate D-Bars. Once the food ran out, they killed a cow and ate it. The men drank from streams and accepted food from local farmers, but it was never enough. “We were looking for crumbs,” recalled Nobles. Whenever the men had free time, they picked lice off their bodies and cracked them between their fingernails. “Our pastime,” Nobles called it. On June 11, Nobles and his group clashed with a larger enemy force. He spied a group of Germans walking across a field, raised his trusted M-1 Garand, and aimed at a soldier. “I fired, and he fell,” he said, simply. The paratroopers managed to nab a few prisoners during the skirmish. 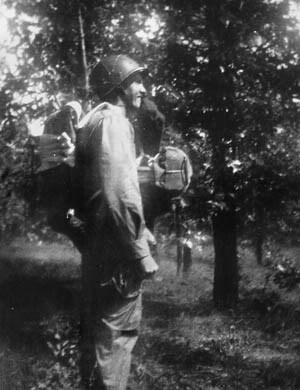 Soon thereafter, a German “potato-masher” grenade exploded in the tree above Nobles, but he escaped harm. The Germans attacked and the Americans pulled back to a farmhouse. With the Merderet River to their backs, they could not retire any farther. While the Americans put their German prisoners into the farmhouse, one American climbed into a wine barrel and fired on the encircling enemy. Things looked bad for the Americans. “We were surrounded,” said Nobles. Nobles was lying on the ground next to the farmhouse when a German shell screeched overhead and smashed into the structure. “It was a hell of a scary sound,” he recalled. A few minutes later a paratrooper told him the lieutenant had ordered everyone to lay down his arms. The fight was over. The Germans emerged and began disarming the Americans. Nobles thought they looked odd. “They looked like gypsies,” he said. “They didn’t have usual uniforms.” An English-speaking German officer oversaw the surrender. One German took Nobles’ rifle while another took his watch. Angry about the robbery, Nobles tapped the officer on the shoulder and told him what happened. The officer made the man give back the watch. Allied bombers raided the Trappes Marshalling Yard in Paris, while Nobles and his fellow prisoners of war remained locked in a train car. It was dark once the Germans finished organizing the Americans into ranks and marched them to some waiting trucks. The next day as the trucks headed into the interior of France, American P-47 Thunderbolt fighters swooped down on the caravan. Some of the men dove into a roadside ditch while others remained in the trucks as the planes opened fire. “Those .50-calibers made some sound,” recalled Nobles. “We didn’t know if they were trying to help us get away from the Germans.” Unfortunately, the planes killed some of the American POWs. After the raid, the train continued its journey. For bathroom facilities, the Germans set a bucket in the middle of the boxcar, but there were too many prisoners for it. Nobles spent most of the trip looking at the countryside through a small window until someone urinated through it. “It got pretty smelly in there,” he remembered. The train crossed the border into Germany and, after several days, arrived at Oflaf XIII-B, a POW camp in Hammelburg. German civilians lined the way as the men dismounted from their car and marched into the camp. German men with missing limbs stared at them with hatred in their eyes. “Good thing they didn’t have guns,” said Nobles. The camp contained British, Polish, and Russian prisoners and boasted a library and a swimming pool. The POWs even formed soccer teams, but Nobles never got a chance to enjoy the amenities or the camaraderie of sports as he and his comrades were soon transferred to a coal mine in the Sudetenland area of Czechoslovakia. For the next nine months, Nobles toiled in the mine with his fellow POWs and Czech civilian prisoners. The civilians would drill holes in the coal veins and then blast them with explosives. The POWs then shoveled the loose coal into rail cars. The work was dirty and dangerous, both because of its nature and the management. The coal was stored in underground rooms with 12-foot-high ceilings. “You could hear the creaking of the coal,” Nobles recalled of the unsteady room. 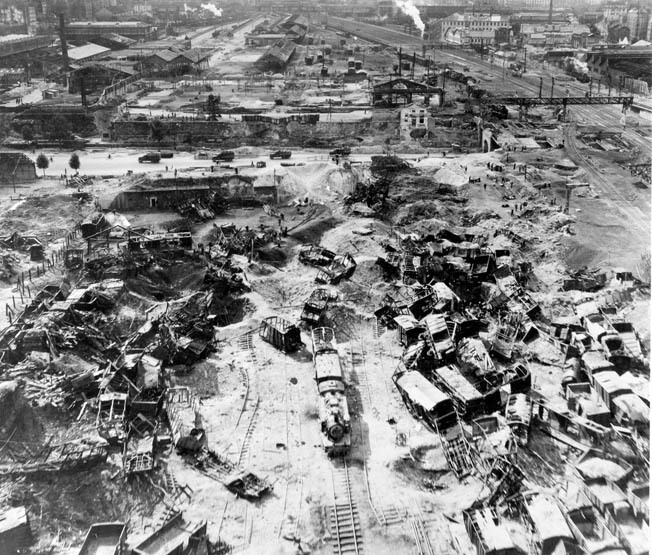 One paratrooper from Nobles’ company was killed when a huge chunk of coal broke off the mine’s ceiling and crushed him. When the other prisoners found out, they refused to work and remained in their barracks until a guard walked in and shot one of the protesters as he lay in his bunk. The men then went back to work. In another incident, a prisoner tried to escape, but the Germans shot him dead. As an example to the other prisoners, they laid out his body in the camp yard. Nobles’ POW number was 743, which he had to learn in German for roll calls. Once, when the guards read off numbers to assign men to a double shift, Nobles did not answer, not wanting to return to the mine. When they realized what he had done, they sent him below for 18 hours. It was enough to teach him a lesson. “So I started doing what I was supposed to do,” he explained. Nobles worked with Czech civilian prisoners, some of whom came from their homes every day. One Czech wore good clothes, but once in the mine he changed into his mining clothes and sent his good clothes up on a pulley. When the shift ended, his clothes were lowered back down, and he would shower and change. Nobles eventually made friends with the Czech, who would sometimes bring him food from home. “He’d bring an apple and I’d eat it, seeds and all,” said Nobles. Food became an obsession and the main topic of almost every conversation among the prisoners. “I’m never going to walk by a bakery shop and not go in,” Nobles would say about the future. The men scrounged food. They often collected vegetables from nearby fields surreptitiously because guards would beat or shoot a man caught stealing food. When marching back to his barracks from the mines one day, Nobles grabbed some potatoes, but they did not agree with him. “I got heartburn so bad I didn’t think I could breathe.” He lost more than 40 pounds over nine months. The only prisoners who never seemed to lose weight were the German-speaking prisoners working in the kitchens. “How come you guys are getting fat and we’re getting skinny?” he asked the cooks. Nobles kept a diary of his time as a prisoner, but when the well-fed cook noticed it, he made Nobles an offer: “I’ll take care of it for you.” Thinking that the prisoner had a better chance of protecting the diary, Nobles gave it to him. He never saw it again. The weather turned cold. “I remember the frost was real heavy,” he recalled, only having his thin cotton jump jacket for warmth. Working in the mines, most men wore through their socks. As a remedy, the Germans showed the men how to fold a piece of cloth over each foot before slipping on their boots. “And that was your sock,” he explained. The prisoners were also left in the dark about the progress of the war. The Germans would sometimes report that their troops had made a strategic withdrawal. “They never said ‘retreat,’” recalled Nobles. 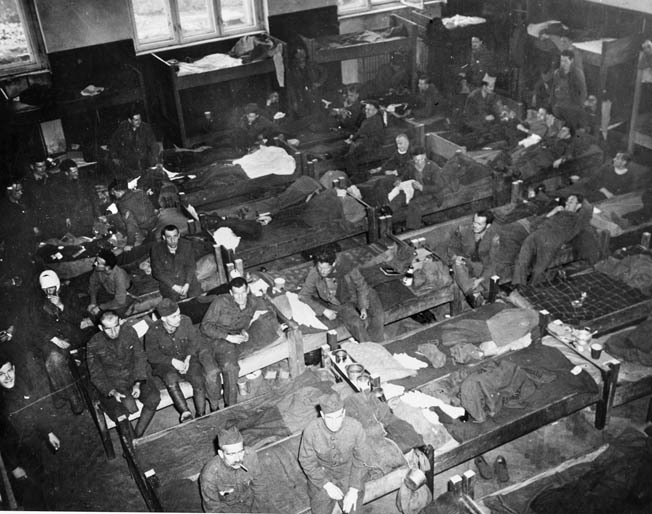 At Christmastime, a wounded German who was once a guard visited the barracks and sang Christmas carols with the prisoners but said nothing about the German offensive in the Ardennes. “We didn’t hear much about the Battle of the Bulge.” The prisoners actually felt sorry for the recuperating German because they knew he would eventually be sent back to the front. American, British, Canadian, and French POWs await liberation in a German POW camp in Faulkenau, Czechoslovakia. There were signs that the war was coming to an end and that he might just make it home. American fighter planes began flying near the camp. “We knew the front was getting close,” said Nobles. When the planes got too close, the Germans marched the prisoners out of camp. On one march when they passed a farmhouse, Nobles and another soldier broke away from the column and hid in the basement. The farmer and his wife protected the two Americans even after German soldiers later occupied the first floor. Their food situation improved as the farmer’s wife brought down home-baked goodies. One day at the end of April 1945, the farmer’s wife walked down the basement steps and reported that the Germans had left. The men hustled up the stairs and out of the house, where they encountered American soldiers who had already liberated their slave-labor camp. “I heard that when the Americans got to the camp they asked, ‘Is there someone we should take care of?’” The prisoners told their liberators about the German who had killed the protesting prisoner who refused to work. “I heard they shot him,” Bob Nobles said. The first thing the liberated Nobles ate was white bread. “It tasted good,” he recalled, reliving the moment. He stayed up all night reading magazines. Soon, he was sent to a hospital to gain back his weight. “They told us, ‘Take what you want but eat what you take.’” They didn’t have to tell him twice. He was in an Army hospital when he learned about Germany’s capitulation on May 8, 1945—VE-Day. “There wasn’t much reaction,” he said. “We were still in the service,” and there was still a war raging in the Pacific. Miners chip away at coal in the warm temperatures of a mine. 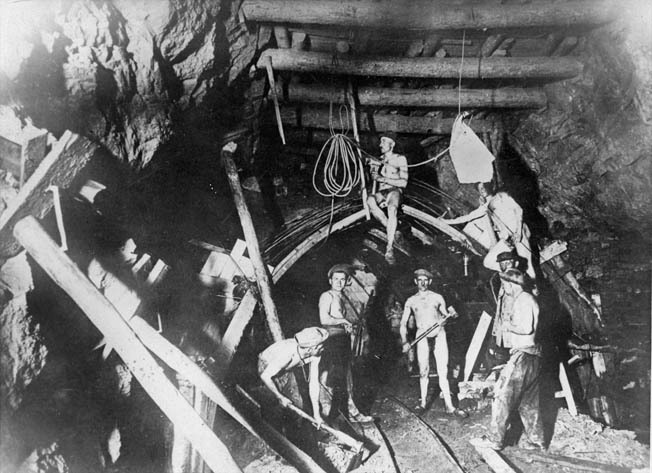 Nobles spent nine months working in a coal mine as a POW. Once Nobles was well enough, he was sent to Camp Lucky Strike in Janville, France, the first leg in the trip back home for many Americans. From there he returned to Nottingham, England, for the boat ride back home. He had been reissued a paratrooper’s jump uniform, but only regular infantry boots. “Everyone had jump boots but I could not get a pair,” he groused. When Nobles arrived in New Jersey in June, he went to call his wife in Ithaca but changed his mind when he saw the long line of soldiers waiting to use the phones. Had he called, he would have found out that his mother-in-law had died that day from high blood pressure. He had missed the chance to support his wife for her mother’s death, but he was determined to make it back to Ithaca for the funeral. At 94 years old, Nobles still looks good in his original uniform. From time to time he reads the four letters his wife sent him before D-Day. Two months later, Nobles lost his worry about again having to leave Bette and take part in the invasion of Japan. The radio announced Japan’s surrender on August 14, 1945, and Ithaca exploded in celebration. Citizens packed the downtown area, cheering any and all servicemen. Nobles attended the joyous ruckus in his uniform with the 82nd Airborne patch on his shoulder; everyone offered the veteran a drink. The happiness had its effect. “I passed out from drinking too much,” he said with a grin. Bob Nobles’ war was at last over. After returning to civilian life, he went to work for the U.S. Postal Service in Ithaca––a career he held for 32 years. Bob and Bette Nobles had three children, two grandchildren, and one great-grandchild; they remained married for 66 years, until Bette passed away in 1997. He still has her coal-covered letters and reads them from time to time. Since that moment when a fellow paratrooper told Nobles that his lieutenant had issued the order to surrender, he has felt guilty that after years of intense training he surrendered after only six days of fighting. He also feels bad that during the Battle of the Bulge the 508th was rushed into the line with the rest of the 82nd Airborne Division while he was working in a relatively warm coal mine. “Anyone would feel that way,” he admitted. When asked if he was proud of his service, his answer was surprising: “It took three years out of my life, but it was worth it.” He enjoys shoveling snow in the winter and says it is no worse than shoveling coal. He also spends a great deal of time reflecting on his past, but there is one promise he made to himself during the war that he no longer feels compelled to follow. He can walk by a bakery shop and not go in. Tags Allies, Axis, Battle of the Bulge, D-Day, English Channel, Fort Benning, Hammelburg, Japan, Japanese, K-rations, memoir, Nazi Germany, Normandy, Operation Overlord, Pearl Harbor, POW, Red Devils, Royal Air Force, SHAEF, Utah Beach.